Mayor Boris Johnson, on official visit to Tel Aviv, 'cannot think of anything more foolish' than Israel boycott. London Mayor Boris Johnson lashed out against boycotters of Israel on Monday, while on an official visit to Tel Aviv. "The supporters of this so-called boycott are a bunch of corduroy-jacketed lefty academics," Johnson stated, in an interview with Channel 4 news. "I cannot think of anything more foolish than to say that you want to have any kind of divestment or sanctions or whatever or boycott, against a country that when all is said and done is the only democracy in the region, the only place that has in my view a pluralist open society," he added, noting the boycotters are a "very small minority" who have "no standing in the matter." 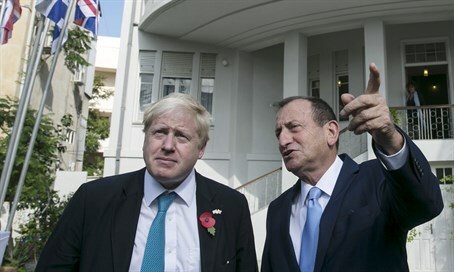 Johnson is on an official visit to Israel Monday, in a bid to strengthen economic ties between London and Tel Aviv - particularly in the business and high-tech sectors.